— Loving others like Jesus loves us is impossible – without the power of Jesus. Good thing Jesus gives us that power – and asks us to use it to love in ways that are not easy. Love doesn’t Always Feel Good. This is the third sermon for Rick Warren’s 40 Days of Love Campaign. This passage makes love sound great to receive, but I think that this kind of love sounds difficult to give. In fact, I would make the bold statement that, the kind of Love that Paul is describing here is impossible to do… without superhuman help. If you want to love someone as Paul described, you will need God’s help. No self-help book can do the trick. No amount of effort alone will work. This Lent, we are working through Rick Warren’s 40 Days of Love campaign with sermons and small groups. The goal is for us to understand the single most important thing in the universe: Love. If you have not joined us yet for small group, check out the bulletin for details. It’s free, we have free copies of the study book, and any lesson you might have missed is available to watch for free on YouTube. So far, in the past two sermons we have explored two key insights that God wants us to understand about Love. First, God wants us to love with the same kind of love that Jesus has for us. Nothing less than self-sacrificial and pure love will due. Loving God and other people this way is the most important thing we can do in God’s eyes. It is the very purpose that we exist. Second, Busyness in our life is the enemy of Love. If you want to be a better lover, you have to slow down, and make intentional space in your life to practice love. Today, we are going to focus on a third key insight that God wants us to understand about Love. That we are only going to be able to love like Jesus if we have God’s supernatural help. The kind of Love that Jesus had for you and me is IMPOSSIBLE for us to achieve without God’s help. The good news for us is that God is willing and able to help us love. In fact, God is excited to help us love, because love is the best thing in the universe, and God really wants the best for us. There are two practical ways that God helps us to love. The first is that God gives us a roadmap to learn how to love in the Bible. The second, is that God supernaturally turns our attempts to love from fails to wins. God is not going to force either of these helps on us, so it is important that we understand these two ways God helps us to love so that we can lay hold of them. First God gives us a roadmap for how we can love well in the Bible. In fact, you can think of the entire Bible as God’s love letter to humanity. In scriptures we find all we need to know how to love God and one another. God gives us instruction through the law of Moses, the Prophets. And the wisdom writings teach us how to love as well. The letters of the New Testament give us case studies to see how we can love one another as a worshipping community. One of the easiest ways to learn how God loves humanity is to look at all the scriptures we have about How Jesus behaves. Jesus was a perfect lover. And Jesus does some unexpected, difficult things out of love. Things that we might not even think are loving. One such case when Jesus confronts a rich young man in Mark chapter 10. A rich young man comes to Jesus and asks how he can inherit eternal life. Jesus says, “you know the commandments” The rich man replies, I know these and I have kept them since I was a boy. Jesus looked at him and loved him and said, “one thing you lack. Go sell all you have and give to the poor, and you will have treasure in heaven. Then come, follow me.” I would expect Jesus out of love to hug the young man or tell him how pleased he was. But that is not what Jesus does. Jesus calls him to an even higher level of obedience and risks rejection. And we find out that Jesus is indeed rejected. Jesus delivers some nasty truth to his own leaders out of love. In Matthew 23:15, Jesus says, “Woe to you, teachers of the law and Pharisees, you hypocrites! You travel over land and sea to win a single convert, and when you have succeeded, you make them twice as much a child of hell as you are.” We learn from Jesus that in love, there is indeed a place for a bold word. And there are countless other examples of how God loves humanity in unexpected ways in the scriptures. I never thought about the Bible in this way until this study, but the Bible is a way that God helps us to learn to love. This is one reason why believers in Jesus need to study God’s word regularly. Everything we need to know to fulfill the law of Christ to love God and love one another is in the scriptures for us to discover together. This is one of the most practical ways that God helps us to love. As we begin to talk about real love, the kind of love that Jesus has for us, we will see, real love is different than what most people think. This is mainly because real love means we that we are willing to love others even when it does not feel good for us. The Apostle Paul knew this fact well. Paul wrote the love passage of 1 Corinthians 13 one of the best summaries of Godly love. Paul wrote multiple letters to the church he started in the Greek town of Corinth. We have two of them in the bible: 1st and 2nd Corinthians. And if you have ever read through these letters, almost every single chapter deals with a problem in the congregation at Corinth that needed fixing. Sounds like a contentious letter, doesn’t it? And yet, this is where we find the famous love chapter, tucked into series of letters from Paul to a congregation, telling the congregation all the problems it needs to fix. And when you read the list of problems, they were serious and personal, and kind of ugly. And Paul writes this to the congregation that he loves. But since when is pointing out everything I’m doing wrong loving? How does airing my dirty laundry and calling me out in church equal love? Well, real love is different than most people think. And it is harder. Love is impossibly difficult because to real love requires work, sacrifice, honesty, and conflict. Just think about what Paul says. Love requires patience, kindness, selflessness, restraint, full honesty, trust, hope, and perseverance! And this is just the beginning. Can you imagine loving like that without work, sacrifice, honesty, and conflict? It wouldn’t really work. Loving like Jesus is hard work, and often it does not feel good. No person on earth has ever been able to love consistently, except Jesus Christ. So this is an area where we all can use some help. I’m talking about myself here the same as you. It is a good thing that God helps us by giving us a guide in the words of scripture. There is a second way that God helps us to love when loving seems impossible. The Second way God helps us is by supernaturally empowering our attempts to love, even when we feel like we have failed. Through the power of the Holy Spirit, God works all things for Good. We read this in Romans chapter 8. Those of us who believe in Jesus as Lord and Savior, have the gift of the Holy Spirit within us. When we attempt to love in the selfless, humble, and righteous way God teaches us to love, God works with our attempts, blessing our efforts and turning even what seems like a dismal failure into a way to fix our broken relationships. This is incredibly good news. It means that every time we step out and take a risk to love God or another person, God works our attempts for good. This is very good news indeed. As I discovered early on, most of my attempts to love started out good, but ended in failure. In fact, I got so frustrated and disappointed by my failed attempts to love others that I just about gave up on it. Then I learned a spiritual secret that changed everything. That secret is that God knows we are going to fail, but it is the effort that God wants. And God will bless that effort and help us to become better lovers. Just ask my wife if you question what I am saying. Over the years I have failed more times at love than I can count. But, although my attempts to love Jenny in a selfless way failed, God blessed each time I tried, and God supernaturally advanced my abilities far beyond what I am capable of. In fact, if it wasn’t for God’s supernatural power, my selfish, sinful nature would keep me from loving selflessly all together. Thank Goodness that God helps us! Our second scripture from Matthew’s Gospel is a great example of how Jesus helps us when we try to love others. Jesus walks out to the disciples who are in the middle of a great lake in bad weather. Peter, wanted Jesus to allow him to walk on the water. Peter stepped out of the boat, and he gave it his best try. And he failed hard. He got scared by the wind and started to go under. Then Jesus had to lend him a helping hand to get him safely back in the boat. This is perhaps the best description of how our attempts to love could go. Jesus says “come” we step out – and we sink. Then Jesus catches us by the hand, and helps us up. This is how we should expect our attempts to really love others will go. We try to love selflessly, and we fail, but God helps us. Every single time, God’s power is shown in our attempts, and God perfects us a little bit each time. Remember, that Peter’s attempts to love Jesus often didn’t go well. In addition to almost drowning in the lake, Peter denied Jesus three times after his capture. And yet, Peter is the one whom Jesus charged to feed his sheep. Yes, love is impossible for us, but as we practice it, God’s power helps us become better lovers. In short, God wants us to attempt the impossible by loving others like Jesus loves us. God will bless those attempts. God’s power will give us what we need to love others. In fact, the only real failure we can have when it comes to loving is not to try. That takes some of the pressure off for me! When loving requires something that is beyond our power, if we make the attempt, that is a win! Even if it seems to go horribly! Relationships are full of sinful people. Therefore, loving others like Jesus loves us is basically impossible. But God wants us to try. And God gives us power through the Holy Spirit to perfect our love. But if we don’t get out of the boat and try, we will never be able to walk on the water. Over the next few weeks, We are going to look at some of the harder, more challenging aspects of real love. If you haven’t been convinced yet that love is impossible without God’s help, you will be soon. 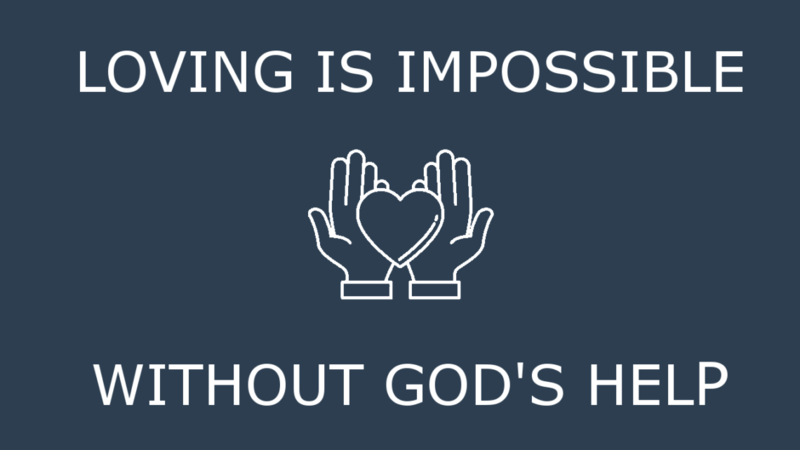 But our God makes the impossible, possible. God helps us to love with God’s supernatural power. Today I discussed two very concrete ways that God help us love like Jesus loves us. First, God gives us all we need to know about how to love in the Bible. It’s all in there, in God’s epic love story. Second, God blesses every attempt we make to love God and love others by working every attempt for good. Because of God’s grace, we can truly be loving in our relationships with God and one another, fulfilling both the law of Christ, and also, our deep need for loving, meaningful relationships.